Poonam Sinha has joined the Samajwadi Party in the presence of party leader Dimple Yadav on Tuesday. 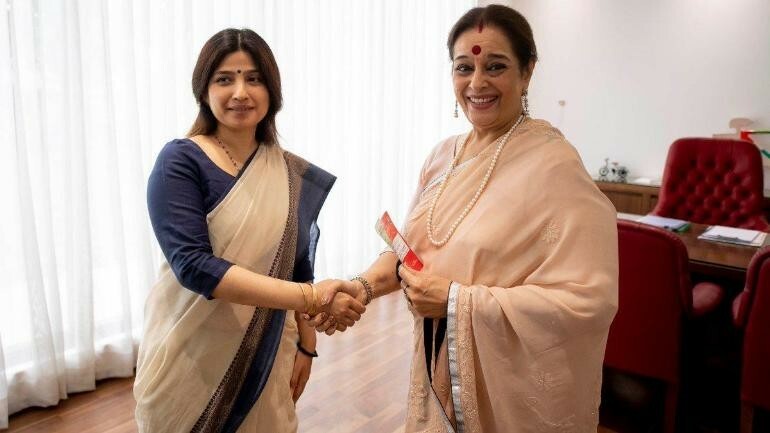 Poonam Sinha, the wife of actor-turned-politician Shatrughan Sinha, has joined the Samajwadi Party (SP) in the presence of party leader Dimple Yadav on Tuesday, April 16. Poonam Sinha is expected to contest the Lok Sabha elections 2019 against Union Home Minister Rajnath Singh from the Lucknow parliamentary constituency. This development comes almost a week after Shatrughan Sinha joined the Congress party after quitting the Bharatiya Janata Party (BJP), his party of almost three decades. This will definitely pave the way for a one-to-one face off between Rajnath Singh and Poonam Sinha. The decision to field Poonam Sinha as the joint (SP-BSP) opposition candidate against the Union Home Minister is seen as an attempt by the opposition parties to keep Rajnath Singh confined to his constituency. Poonam Sinha is yet to be given a ticket for the Lok Sabha polls. A leader of the SP had earlier said, "Poonam Sinha is a Sindhi while her husband Shatrughan Sinha is a Kayastha. This is going to give a major push to her candidature from Lucknow." During the 2014 Lok Sabha elections, Rajnath Singh had won the Lucknow seat garnering 55.7 per cent of the total 10,06,483 votes polled. He had won in all the five assembly segments of the constituency. The first phase of polling in UP saw a voter turnout of 63.69 per cent for its eight constituencies that were held on April 11.